JACK Meterbridge by Steve Harris is a versatile multichannel Jack metering client. 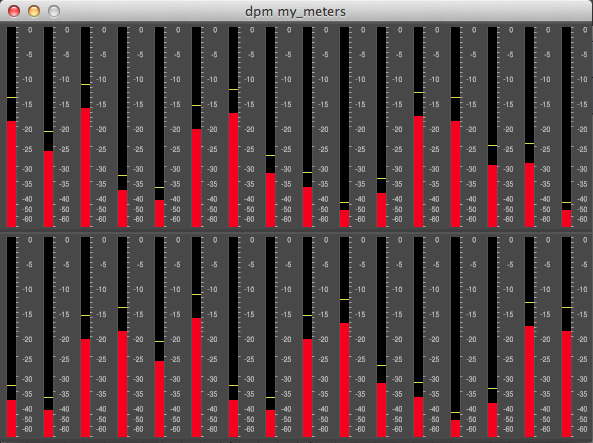 Many different styles of meters with arbitrary channel count may be displayed. I built and made an installer for MacOSX ≥ 10.6. 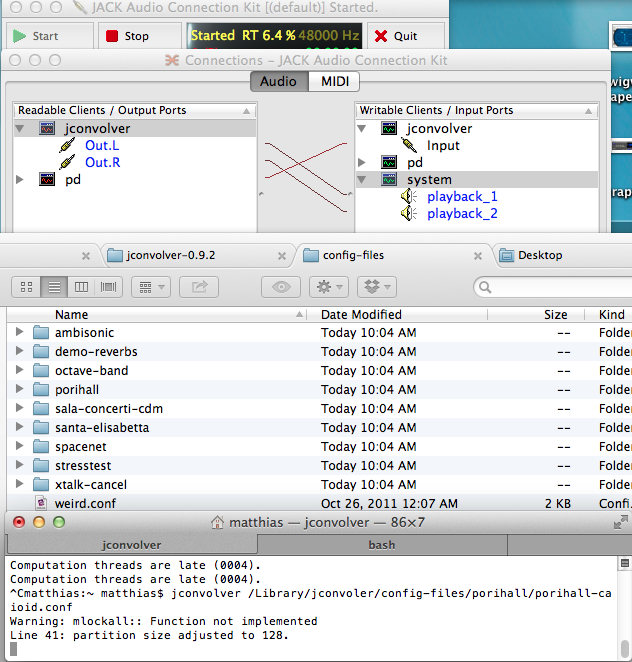 As addition to the Ambisonics Decoder, Microphone Processor and LADSPA Plug-Ins I compiled and packed the convolution software jconvolver 0.9.2 as easy-to-use installer for Mac OS X >=10.6. This Jack client is a very flexible real-time convolution engine, including configurations for applying Multichannel Ambisonics reverb. 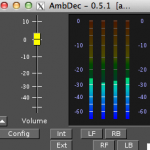 Get more information about Ambisonics and Ardour in an article by Jörn Nettingsmeier. 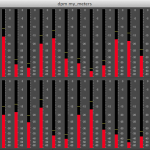 I compiled the latest versions of Fons Adriaensens‘ Ambisonics Decoder ambdec-0.5.1 (PDF manual) and his Microphone-Processor to convert TetraMic recordings to B-Format tetraproc-0.8.2 (PDF paper) for Mac OS X. Note about ambdec: The manual is outdated! The configuration window is gone. 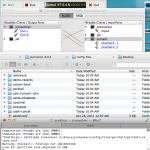 Use a Texteditor to edit .ambdec files! Make sure you have JackOSX (http://www.jackosx.com) and X11 (http://xquartz.macosforge.org) installed. Troubleshooting: Sometimes the installer does not set the file permissions for graphic files correct, try to check if the folder /usr/local/share/ambdec is read/writeable for the user. You can start ambdec from Terminal and check for error messages (just type ambdec in Terminal and hit Return). Additionally I compiled and packed the LADSPA Ambisonics Plug-In Set (AMB-plugins-0.8.1) for 32/64 bit on Mac OS X >= 10.6 to use within Ardour.